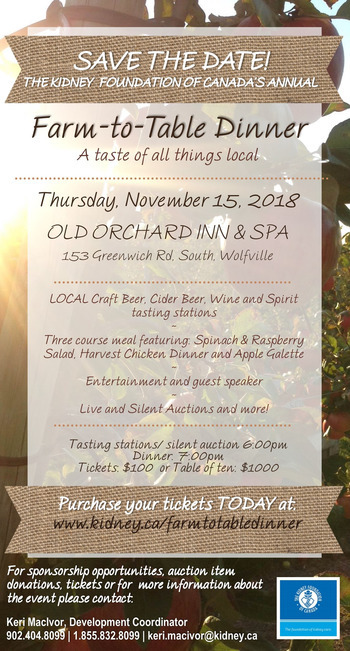 Our 3rd Annual Farm-to-Table Dinner, will be starting off with four different tasting stations featuring LOCAL craft beer, cider beer, wine and spirits. A delicious meal prepared with local ingredients. There will be live and silent auctions throughout the night and some fantastic entertainment! The Kidney Foundation has supported thousands of kidney patients in our province and has raised funds to support life-saving kidney research across Canada. This year, we have provided support to over 470 Atlantic Canadian kidney patients who have come to us for financial support. By attending our Farm-to-Table Dinner, you have the opportunity to make a real and meaningful difference in the lives of kidney patients and their families. Your support will allow us to expand patient service, education and research.